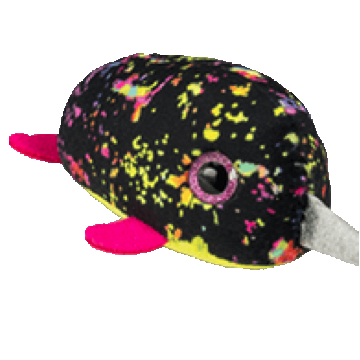 Nori is a tiny narwhal covered in a black fabric with flashes of yellow, pink and purple. She has purple glittery button eyes and a yellow belly with a shiny silver horn on her head. Nori’s fins are bright pink. The three variations of Nori are this pink fin version, a green fin version, and a turquoise fin version.